...and I just can't hide it!!! This time tomorrow, I will be in Florida taking in all of the Disney sites! I've been invited down to the African American Mom Bloggers Mixer and am so looking forward to meeting and networking with other attendees. There seems to be a lot in store for us for this weekend...did I mention that I was excited? Man I feel like a kid in a candy store! I have absolutely NO IDEA how I got invited or how they came across my blog, but I'm counting my blessings that's for sure. Thank you God! May has truly been an exciting month for me! Of course before I go, I still have a mountain of responsibilities before I jet off sans the hubster and kiddos! It's a very busy day for me since I didn't do the things I had planned to yesterday. I washed my hair this morning dropped the boys off, ran to the grocery store, ran to the mall (bought Angels and Demons to read on my trip). I'm about to clean the bathroom and kitchen, I need to give myself a pedicure, pack for my trip, make chicken and veggies for dinner tonight with enough leftovers for tomorrow, and spaghetti sauce to freeze so all Troy has to do is cook the noodles and mix everything for dinner Saturday and Sunday...you know so they don't "starve" while I'm gone. I need to pick up the boys and then head to Trenton to take them to the circus (I heart Ringling Brothers)! Phew, hope I get it all done! You know I've already gotten the "don't go" pleads from Donovan. He's giving me the eyes and everything, but I gently let him know that I will be back and I promised to bring him something back! Shoot, mommy needs a break and a chance to unwind and concentrate on herself so she can be a better mommy to her babies. I'm going to miss them like crazy, though!!!!! Just look at them together! I took this picture Sunday morning from my scrap table. We had just finished breakfast and headed down to the basement, Donovan asked for a juice box and decided to share with Xander. He's such a generous little boy! Looking at this picture, I think of how I wouldn't have been caught dead not giving Donovan 100% juice at this age, now here's Xan slurping down a Hi-C and I didn't even flinch. Funny how relaxed my standards have become....or maybe I just don't see the point in getting so uptight about certain things that don't really matter. I'm going to miss my babies, but I'm also going to have a BALL!!!!! WOOT WOOT!! I'll make sure to take a ton of pics! 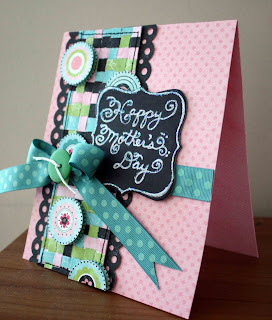 I made this card using a card sketch created by Eva. 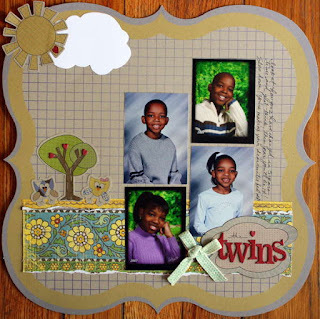 Next up is a layout using older pics of the twins, my niece and nephew. Weren't they adorable? 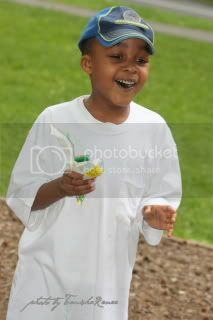 This one is of Donovan--he is one little boy who LOVES when it rains! One day he begged and begged me to let him play in the rain. I did and he had so much fun! Lots of cut work and hand stitching on this one. 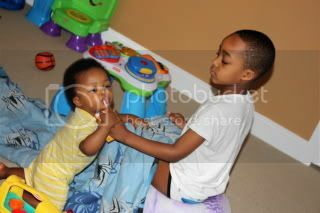 Photo is of my boys this past Easter. I sprayed the acrylic with Shimmerz Spritz (I placed the acrylic LO on a black backdrop so you can see the the shimmerz better). 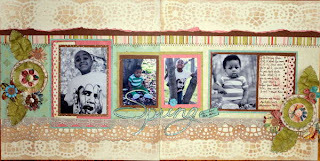 Here's a Spring layout I created using photos from one of our park photos from last month. 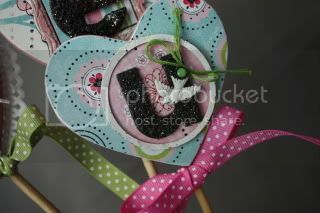 I used Creative Imagination's doily paper and glimmer mist to create the mask. Thanks Toni Ann for this award! Do you practice this at your house? Well with 2 boys who put everything in their mouths, I had to relax my standards a little bit. I actually saw a report of an experiment done that said you actually have like 30 seconds as opposed to 5! Woohoo for me 'cause only God knows what my boys pop in their mouths when I'm not looking. Mind you one of them is 5 years old! Well anyway, the other day I'm sitting in my craft room feeding Xander popcorn and a piece fell on the floor. Without thinking, I picked it up, kissed it, blew on it, stuck it up to God and gave it to him. Awww, come on now, you know you've done it, too! LOL! Well this smart, attentive little 13 month old immediately mocked my actions! He dropped a piece of popcorn, blew on it and then ate it! Oh.my.goodness! Now I see him all over the house picking up stuff and blowing it! Too darn funny! I can't believe he caught on that fast. I'm really going to have to watch myself around him! I took the boys to the park yesterday, that's our favorite pastime when the weather gets warm. I took a ton of pics, but these were just a few of my faves! Just look at that precious little face. He's watching the kids play and just taking it all in! Note to self: find Donovan another Spiderman cap, this one is too small! Here's my big boy dripping green popsicle juice all over his brand new white T-shirt! I guess that's why they made bleach, huh?!! ...and Xander thoroughly enjoyed every moment of it! I just love this photo of them! Enjoy your Memorial Day! Thank you so much to all of the men and women who have put and continue to place their lives on the line to ensure our safety and freedom! I can't thank you enough! 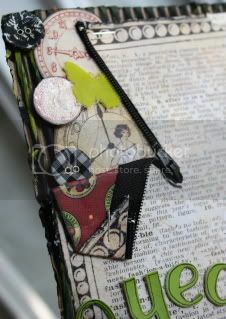 This is what I looooooove about ordering from scrap-diner...the shipping time is just amazing! I placed this order Tuesday afternoon, on Wednesday I received an email stating that my box had shipped and yesterday (Friday) my box of goodies was at my back door! We're talking from Arizona all the way to NJ. Now that's what I call service!!! I hate it when I place an on-line order and it takes 2 weeks to get to me. You certainly won't get that at the diner, hell my box is still smokin' from the lightening fast service! Now I get to play with my goodies, sooner than later! If you shop on-line and you're looking for good service, head on over to the Diner, Sher won't dissapoint! On top of good service, you'll get a little "thank you" in every box! What amazing talent you have! Thank you for your inspirational ideas! 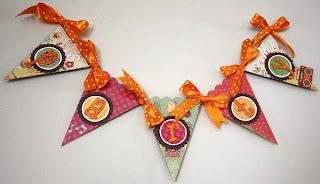 t-bair, email me your addy and i will get your ribbon RAK out to you! Thank you so much to everyone for all of the awesome comments!! Robyn Weatherspoon, Melanie Stanczyk, Heidi Sonboul, Pamela Young, Michelle Magana, Bethany Kartchner, and our correspondents at the MLS news desk (they will be making fun videos) Heather Brown and Erin Payne. Welcome to the team ladies, I can't wait to see what you all create!! Run and check out Shimmerz Paints blog for all the information you need on the much anticipated introduction of Spritz! The colors are so yummy, you just have to see for yourself! 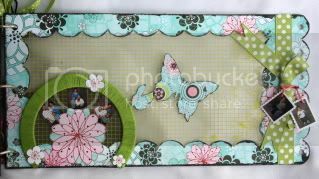 Here are the projects that I created this month as guest designer for Bo Bunny! It's very photo heavy, but be sure to make it all the way to the bottom *wink, wink*. I could have gone on and on creating with these gorgeous Alissa papers, but seeing as I have kids, a job, and a household to maintain, I had to pry myself from my craft table. LOL! I did manage to create 3 layouts, an altered gift, a card, and a mini album, though! 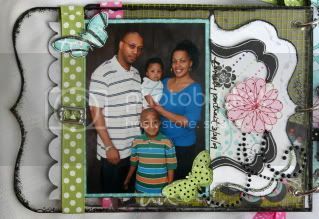 These photos of my boys and I were taken this past Mother's Day. 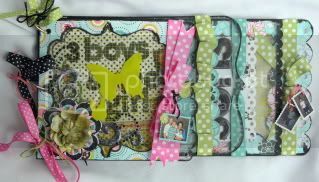 I used a number of papers from this line along with 3 different border punches (another of my latest obsessions) to create this LO about my love for my boys. 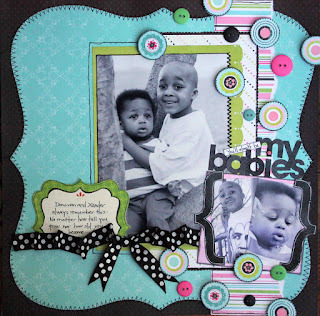 journaling: Nothing could have ever prepared me for the love I feel for my boys. They are the axis upon which my world spins! Here's another sentimental LO (feeling kind of mushy lately). I cutout out 2 of each circle, 1 was adhered directly to the Lo and the other was adhered on top of it's match with pop dots to add dimension. 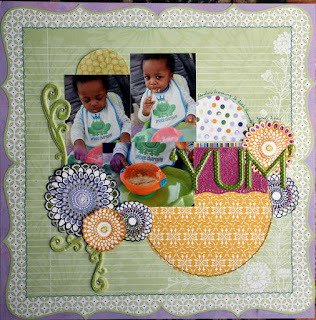 Buttons, stitching, and scrunched ribbon also add a lot of texture here. 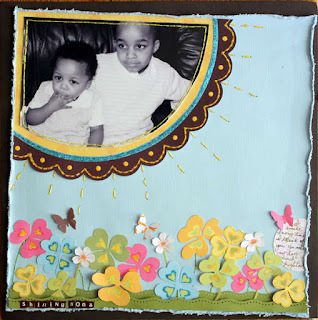 journaling: Donovan and Xander always remember this: No matter how tall you grow nor how old you become, you'll always be my babies. I made this heart flower pot for my mom for Mother's Day as a gift from the boys and she absolutely loved it! 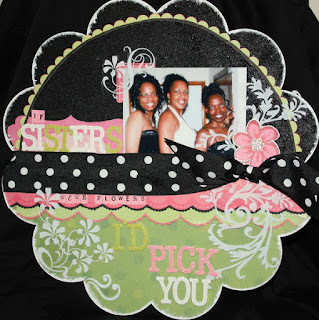 my mom is very crafty, too so she really appreciates the work that goes into a handmade gift. And this bad boy took me days to complete! I first painted the flower pot and hearts pink, then created a template for the flower pot with white paper and cut it out. 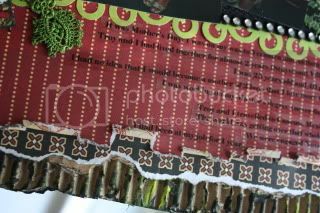 I then cut strips of paper and weaved them on top of the template, adhered and then stitched. 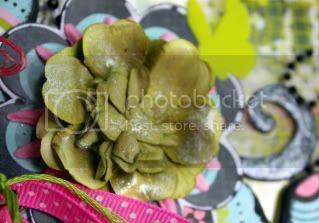 That piece was then adhered to the flower pot with mod podge. I used a die cut sticker to decorate the bottom of the flower pot. Here are close-ups of each letter. 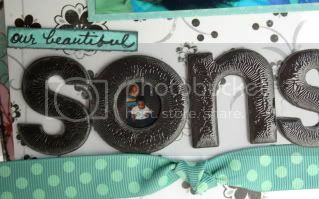 I coated the chipboard letters with paper glaze and then covered with black micro beads. 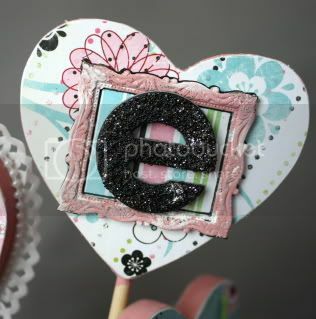 I dumped off the excess beads and added another coat of paper glaze, then lightly sprinkled with silver and allowed to dry completely before adding to the hearts. I painted a metal frame pink and then swiped with white. 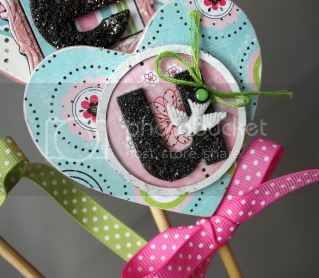 I painted a metal tag and metal bird charm white before adding to the heart. 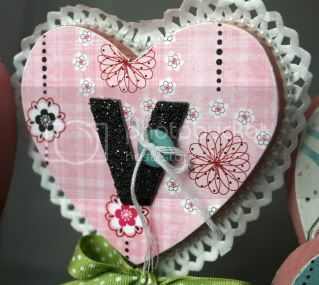 This is the card that I made to go with gift. I swore I had a mother's day stamp, but I couldn't find it so I just wrote the sentiment in white pen and traced with stardust stickles. I used the same circle technique from the previous layout. 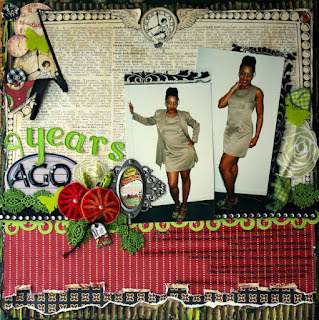 journaling: Who is Tanisha Long? Who am I? And finally the acrylic mini album! 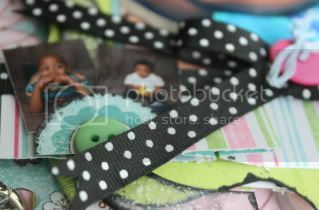 This is a mini album created with mini photos because I wanted the papers to shine. I was serious when I said I loved these papers!! There are 17 photos in this album, but only 3 are "normal" size. 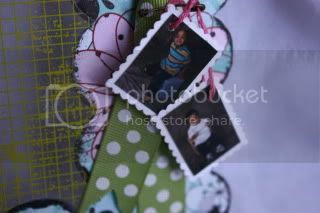 I also used a ton of that yummy double sided ribbon! it's s easy to use because you don't have to manipulate the ribbon to get the print facing outward...you just tie it and go! 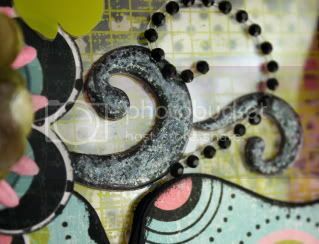 I used some Shimmerz Paints to highlight a chipboard flourish, an acrylic bracket and a paper flower. I painted the edges of the album and the papers black to increase the "pop factor". 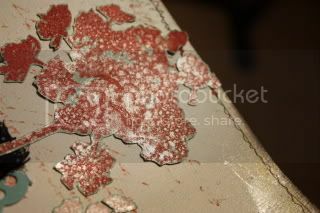 Here's a close-up of how Shimmerz pixie dust paint looks on the chipboard flourish. 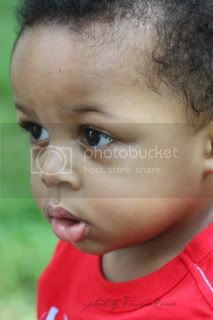 Most of the photos are from our family photo shoot this past March. 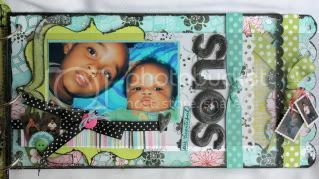 I coated the chipboard alphas with Ranger's crackle accents and used the "O" to frame a photo of the boys. I pleated a strip of striped paper under the main photo and added 2 more mini photos of the boys. 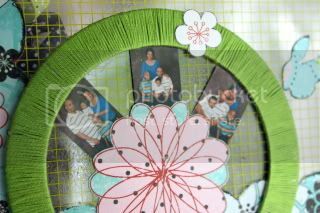 I took a skein of DMC floss and wrapper it around an acrylic circle to form this frame. Thanks so much for taking a peek at this LOOONG post. 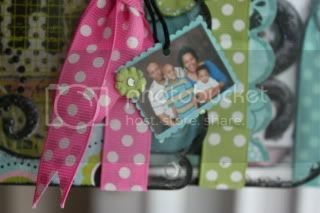 Now I have a ribbon RAK up for grabs! Post a comment here by 8 pm EST on Wednesday to be entered into the random drawing! 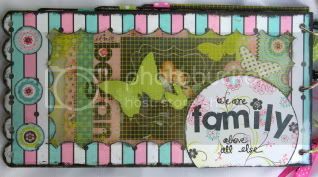 I served on this design team and even designed an acrylic album for the company (Perfect Postage) and now it's closing! This wacked out economy is messing it up for everyone! What a horrible chain effect! "It is with mixed emotions that I write this email to the friends and supporters of My Acrylic Album. Effective May 31st, My Acrylic Album will go into retirement. Many changes have taken effect in the last six months that led to this decision including the slowing of sales in the scrapbook industry and the closure of many of our retail store clients. Save 25% off by using the code CLOSEOUT at checkout! Flate - Rate SHIPPING of $6.95 for each order shipped within the United States! It has been a true pleasure bringing you innovative designs and top quality products. Please feel free to spread the word and share the savings with others!" Dream Girls new challenge is up! As always, I had a ball with this challenge! 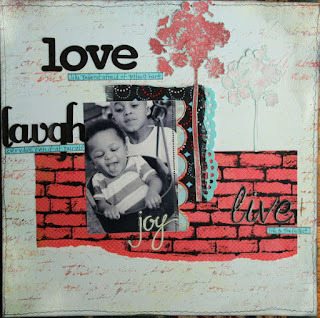 Prompt: the quote "Live, Love, Laugh" - use these words somewhere on your creation. Here's a close-up of the layout! I used the soon to be released product, Shimmerz Spritz Shimmering Spritz. This product has some MAJOR shine to it as you can see here unlike anything else out there on the market! Want a chance to win some? Well head on over to the blog for all of the info you need! Hurry though because you only have until 11:59 p.m. Mountain Time on Tuesday, May 19th to get your entry in! "We're getting ready for the re-introduction of an unbelievably fun product line: Shimmerz Spritz! Shimmering Spritz was the original shimmering sprayable coloring medium. Now 10 years later, Shimmerz Spritz is back and better than ever!You'll be wowed by the sheer amount of sparkle packed into each bottle. It's a great value, too. The price is surprisingly low.The product line will be re-released at midnight on May 20th. At that time, we'll announce all the details like the beautiful brand new colors. Of course, we'll also have plenty of samples from the Design Team to show you. (And, if you absolutely can't wait... check back here before then. We might have some sneak peeks for you!)" So I can finally share my good news with you! 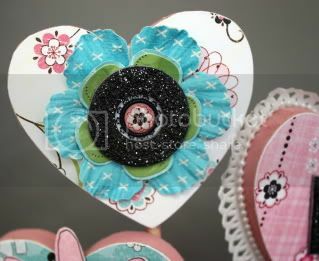 I've been invited to be a guest designer for Bo Bunny this month!!! I have truly had so much fun playing with the Alyssa line. When I received my box in the mail, I literally squealed with delight. 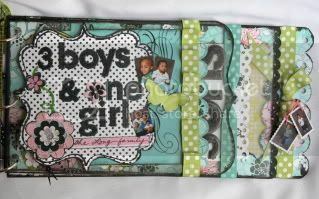 The colors are just phenomenal...pink, green, turquoise with a touch of black that makes everything pop...oh, and the ribbon...it's double sided! It really doesn't get any better than that! 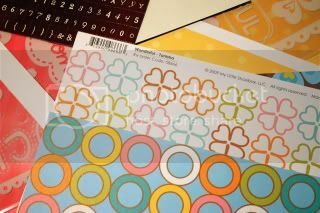 I've created several projects using these beautiful papers, but they won't be posted to the blog until Monday. For now here's a little sneaky teasey of two of the projects that I created. Yes, I'm such a tease, I know! LOL! I can't wait to share the rest with you. I was born and raised in New Jersey, I went to college in New Jersey, and I currently work and reside in.....you guessed it, New Jersey! I guess you could say that I'm a Jersey girl, huh? LOL! 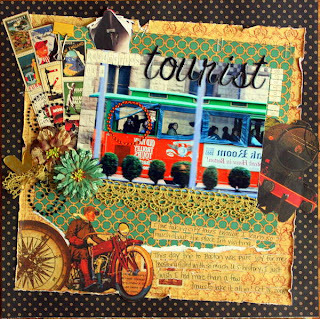 I am married, I have 2 little boys (5 and 1) who are my main scrap subjects, I love taking pictures, reading and traveling. I am one of those scrappers who loves doing BOM pages! I am 34 years old and I still have "sleep overs", of course now we just call them Girl's getaway weekends! To me there's nothing better than a good old fashioned pj party with a few of my oldest and dearest friends! I love anything covered in chocolate or cheese, scrapbook supplies, going to the movies, and just kicking back with my family! So glad you hopped in for a visit...feel free to come back anytime! 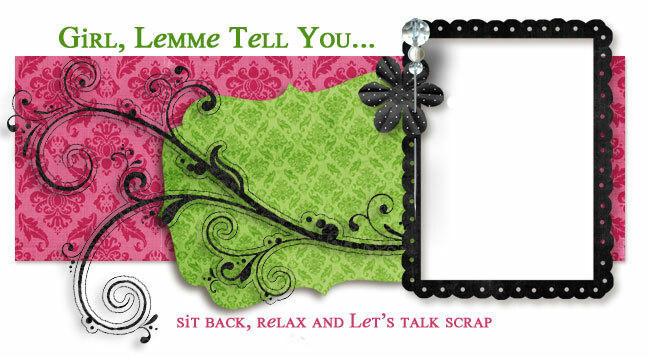 May has been one super spectacular month for me on the scrap front! 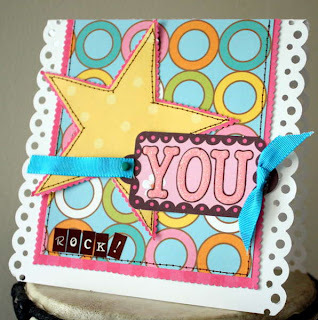 Not only am I the guest designer at Bo Bunny, I have been spotlighted on Graphic 45's blog!!! Talk about a perm-a-grin, you couldn't hammer the smile off my face! I really feel so lucky and blessed to have been acknowledged in such a way. It is such an amazing feeling! 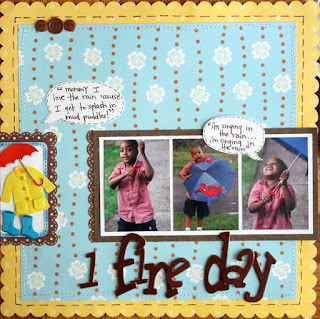 I scrap because I love it, it gives me a sense of completion every time I finish a project and makes my heart swell when I see my son already enjoying my pages. When someone else takes notice of my work, well that's just the icing on the cake and I am so appreciative! I am in love...I mean really in love!!!! I received my package of shimmerz paints and they are FAB-U-LOUS!! I used Blingz- Pixie Dust on this LO and man...oooo, just wait until you see the close up, it has rocketed to the top of my list of favorite products!! **Disclaimer** the amount of sparkle on this close-up may cause eye injury, I am not responsible for any damages! HAHAHAHA!! Just look how the Blingz shine here. I do a little happy dance every time I see it! 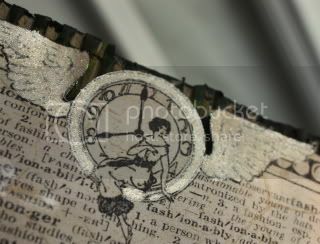 Here, I added it to one of the clocks that I pop dotted for a little visual interest. I layered a bunch of my current favorite products here. 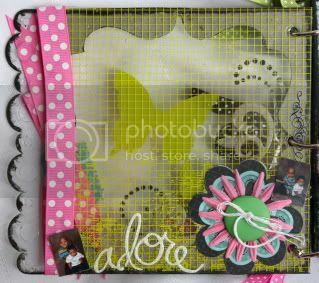 The entire layout is mounted on cardboard that I painted black and lime green. 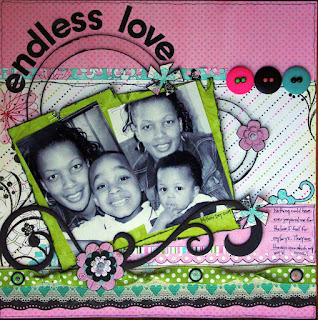 Paper tearing and curling add dimension to the bottom of the layout, and the journaling was printed on adhesive transparency then cut into strips so it didn't overwhelm the design. Head on over to Shimmerz's Blog to take a look at all of the different colors of Shimmerz and Blingz currently available!! One look and you'll be hooked! Purple Cows has started introducing it's new design team! Every week, a new member of the Moo Crew will be in the spotlight on the blog. This week they're featuring Samantha Sibbet; if you want to check out more of her work, just head on over and click on the link to her blog! 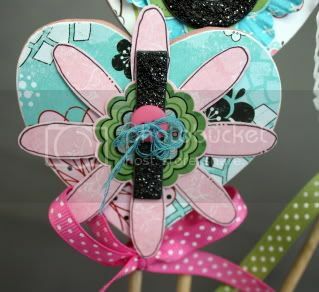 Also featured on the blog this week is an oh-so-cute project created by DT Member, Vicki Flinchum as well as info on how you can get Purple Cows Designer Click Blades at a phenomenally low price at scrapbook.com! My Little Shoebox has moved!!!!! 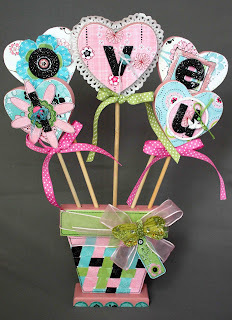 We can now be found at mylittleshoebox.typepad.com...you may want to head on over there because to celebrate our new little home in cyberspace, we're having a contest!!!! Go and check it out! All you have to do is post a reply over there with your name, state and the length of time you've been scrapping and you could win some products!!! That's it! So why are you still here? Go...go...go!!! Oh, but please feel free to come back and visit me anytime! LOL! 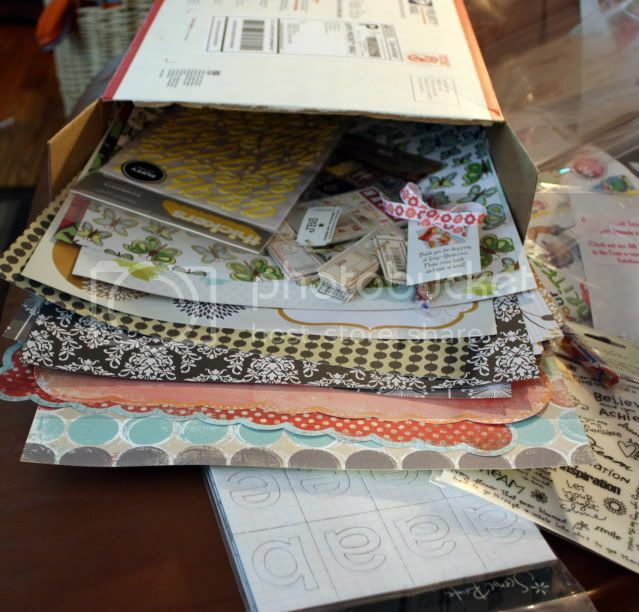 The latest My Little Shoebox project post is up on the blog and oh...my...freakin'...goodness, everyone rocked their projects!!!!! This month the team worked with MLS in addition to Hambly and let me tell you...to die for!!! Seriously!! 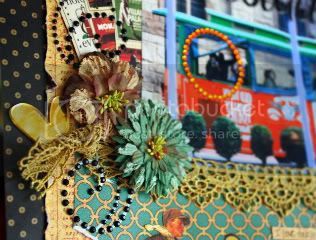 Oh and this month's Guest designer did a fantastic job as well as all of the ladies who sent in various projects to be posted on the blog! 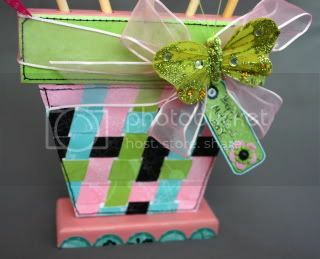 MY LITTLE SHOEBOX ROCKS!!!! Go and check it out for yourself!! OK, so this weekend, I was somewhat of a bad wife and mother! 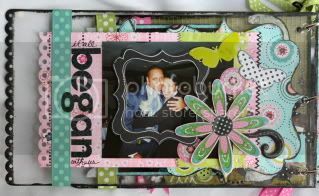 Saturday was National Scrapbook Day and I decided to hide down in my new scrap area and create a few things. I ended up chatting more than creating, but hey it was a "holiday" after all and I could do anything I want...right?! I had no desire to cook or clean--well, I did feed my family and deep cleaned the living room yesterday, but I ignored the rest of the house. And my kids KNOW how to get my attention when they need it! 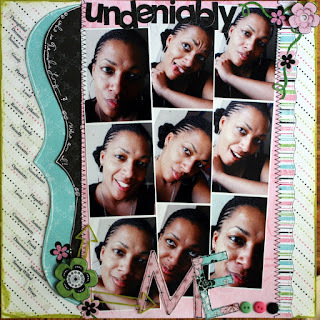 I created a few layouts- this one was my favorite because I designed the layout to describe me (one of the challenges over at scrap-diner.com). The photo is a reflection of myself that I caught in one of the buildings in Boston while riding the trolley. I thought it was a really cool shot. 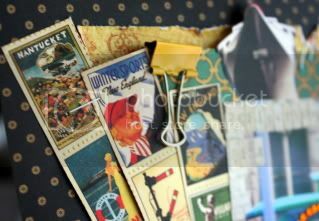 I whipped out the Graphic 45 papers here- they are so rich and worked perfectly with the photo! See the heart in the center of the left side of the page? Well when I first meet people, I'm a little shy and quiet, almost hidden like the heart. Other times, I'm like the orange circle bling, I'm the center of attention. I always have a story to tell that keeps people laughing! You can usually hear my loud laugh for blocks! LOL! Like the bull clip at the top of the page, I hold things together even if by a thread. If you look at me a little closer, you'll see there's more than meets the eye- like the stamps that are held by the bulldog clip. Look a little closer and you'll see that I cut them so the the ones with "New England" are at the top since the page is about Boston which is a part of the New England states. 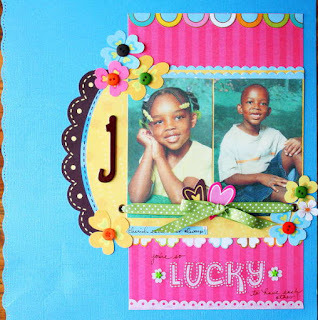 I created this quick and easy LO about my niece and nephew who will be 14 in a matter of months. Watching them grow up is making me feel old! LOL! And this one was created using a sketch provided by Michelle Lanning. It's about my Xander learning to feed himself! OOOh just wait until you see the spaghetti pictures that I took the other day....ME-SS-Y! That's all for now! Scrap-diner's crop lasts all month long, so I'm sure I'll have more to show you as the challenges and prizes are fantabulous!! !